Traveling to New Zealand can be a great option for you who want to witness spectacular landscapes of nature. Besides its breathtaking nature, this kiwi country also has super tasty foods that you must never miss. If you have a chance to visit New Zealand, make sure you try these culinary below. Having one of the longest coastlines in the world and various wealth of the sea, New Zealand is a paradise for those who are a lover of delicious and fresh seafood. One of them is Marlborough Greenshell Mussels. Seafood culinary lovers must not ever miss this healthy and super tasty seafood menu. Marlborough Greenshell Mussels are big and able to be found anywhere in New Zealand in all seasons. This seafood menu is not only delicious but also beneficial for the health, which is to relieve arthritis. Pavlova is a dessert like a cake. It is crispy and soft at the same time. A cream topping is spread out on the top as well as fresh fruits, such as strawberries, passion fruits, and kiwis. 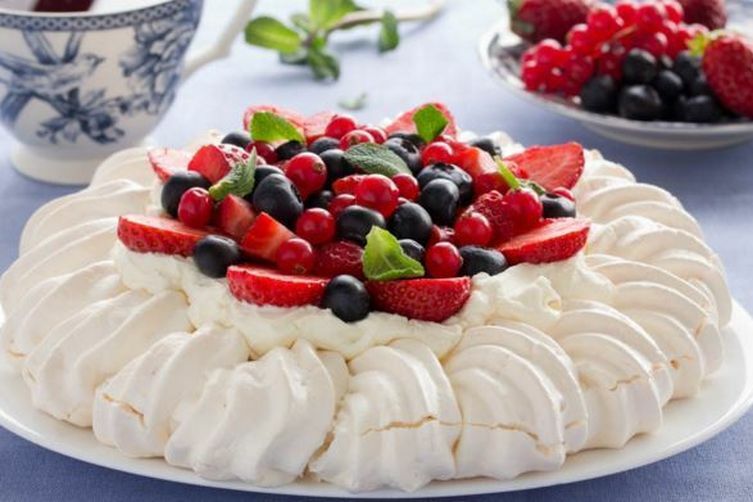 Pavlova is often served during celebration events and holiday seasons, especially at summertime. The name of Pavlova is taken from a ballerina named Anna Pavlova. Hokey Pokey is a typical New Zealand ice cream with vanilla flavor. This ice cream uses honeycomb crumbs as the topping and it is so popular in New Zealand. Hokey Pokey is actually a New Zealand term for honeycomb candies. This Hokey Pokey ice cream is easy to find in various ice cream shops and perfect to enjoy during summer. Make sure you taste this delicious ice cream when you travel to New Zealand. New Zealand lamb is famous for its best quality and it becomes one of the best products exported from this kiwi country. So, it is not surprising that roasted lamb becomes the most favorite culinary of many tourists as well as New Zealand people themselves. The soft roasted lamb is cooked with rosemary seasoning and mixed with various vegetables. This menu will never make you feel disappointed. Hangi is actually a unique cooking method which has been used by Maori tribe for more than 2.000 years. This cooking method puts various seasoned raw food ingredients, such as chicken, various vegetables, and seafood, into a wire basket covered with aluminum. The aluminum wire basket then is put into a big hole under the ground that has a volcanic heat for 3 hours to 4 hours. Hangi is very popular in Rotorua. This menu is usually served with music and dances that make Hangi tastes even more delicious. Some coffee shops in New Zealand usually serves Mince Pie. This menu is a pie filled with meats and broth sauces. Other fillings are sometimes also added such as cheese and mushrooms, depends on the customers’ orders. Mince Pie is best served when it is warm. Do not forget to try this menu when you are traveling to New Zealand.